Guys,you may have seen Mr. Robot and remember the event when Fsociety use the DDoS as a calling card to lure Elliot into helping them take down E-Corp or you may have been struck in situation when you try to open a Website only to see a notification that Website is down. What is this? Yes, this is a DOS Attack. 1) Ping Of Death :- The ping of death attack sends oversized ICMP datagrams (encapsulated in IP packets) to the victim.The Ping command makes use of the ICMP echo request and echo reply messages and it’s commonly used to determine whether the remote host is alive. In a ping of death attack, however, ping causes the remote system to hang, reboot or crash. To do so the attacker uses, the ping command in conjuction with -l argument (used to specify the size of the packet sent) to ping the target system that exceeds the maximum bytes allowed by TCP/IP (65,536). Fortunately, nearly all operating systems these days are not vulnerable to the ping of death attack. 3) SYN – Flood Attack :- In SYN flooding attack, several SYN packets are sent to the target host, all with an invalid source IP address. When the target system receives these SYN packets, it tries to respond to each one with a SYN/ACK packet but as all the source IP addresses are invalid the target system goes into wait state for ACK message to receive from source. Eventually, due to large number of connection requests, the target systems’ memory is consumed. In order to actually affect the target system, a large number of SYN packets with invalid IP addresses must be sent. 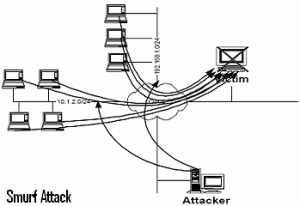 4) Land Attack :- A land attack is similar to SYN attack, the only difference being that instead of including an invalid IP address, the SYN packet include the IP address of the target sysetm itself. As a result an infinite loop is created within the target system, which ultimately hangs and crashes.Windows NT before Service Pack 4 are vulnerable to this attack. 5) Smurf Attack :- There are 3 players in the smurf attack–the attacker,the intermediary (which can also be a victim) and the victim. In most scenarios the attacker spoofs the IP source address as the IP of the intended victim to the intermediary network broadcast address. Every host on the intermediary network replies, flooding the victim and the intermediary network with network traffic. Result:- Performance may be degraded such that the victim, the victim and intermediary networks become congested and unusable, i.e. clogging the network and preventing legitimate users from obtaining network services. 6) UDP – Flood Attack :- Two UDP services: echo (which echos back any character received) and chargen (which generates character) were used in the past for network testing and are enabled by default on most systems. These services can be used to launch a DOS attack by connecting the chargen to echo ports on the same or another machine and generating large amounts of network traffic. Distributed Denial Of Service (DDoS) :- In Distributed DoS attack, there are 100 or more different attackers (systems) attacking the single system. Due to higher number of attackers DDoS attack is more effective and dangerous than regular DoS attack. The attackers have control over master zombies, which, in turn, have control over slave zombies, as shown in figure. No system connected to the internet is safe from DDoS attacks. All platforms, including Unix and Windows NT, are vulnerable to such attacks. Even Mac OS machines have been used to conduct DDoS attacks. No softwares, you wanna try it yourself, you can use HPING(comes preinstalled in KALI LINUX). Open the console and go to the path of hping3 and give the following command. Here we are sending SYN packets (set value by replacing 0) with a random source. Here we are sending SYN + ACK packets from a random source. Flooding the target IP with UDP packets. In this command, we are sending SYN+ACK+FIN+RST+URG packets with TCP ack (-L) and TCP seq (-M). Change the values after -L and -M.
Flooding with ICMP packets by spoofed IP (–spoof). WARNING: IT IS ILLEGAL TO DOS attack A COMPUTER NETWORK NOT OWNED BY YOU. TRY IT IN YOUR OWN NETWORK ONLY.